In many parts of the country winter has finally arrived, if it didn’t show up with a bang already and whimper away – which means it’s time to consider how you’re going to clean snow and ice off your vinyl deck. 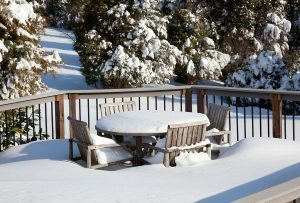 Keeping your deck clear, slip-free, and safe is key to having a good winter and to avoid damage to your deck. Tuff Industries has put together easy and safe ways to clean your vinyl deck. Snow shovels provide an easy way to clear snow and cut down on the amount of de-icer requires to reduce slippers spots – but it’s important to ensure that your shovel will not damage your vinyl deck surface. You’ll need a plastic snow shovel with a good, straight edge. A metal-edged snow shovel could inadvertently cause damage to your vinyl deck membrane, while a chipped plastic edge can have the same effect – check your shovel carefully before use. In order to keep your vinyl deck surface safe for walking, you’ll want to clear a path as soon as possible – it might be wise idea to keep a snow shovel on your vinyl deck (rather than going on a search each time) so you can clear it as soon as possible, rather than letting snow build up. Remember that if you live in an area with wet snow, it’s going to be difficult to clear if you don’t get out there regularly. When snow, slush, or melted water settles on your deck it can create a hazardous situation – particularly if you regularly use your deck to traverse to other parts of your property. However, you want to ensure that you don’t damage your deck by using a de-icer that could damage the vinyl membrane. Fortunately, Tufdek™ vinyl decking was designed to stand up to the rigours of snow, ice, extreme cold, and the need for de-icing products or salt. It is important, though that you thoroughly clean your deck in the spring to clear it of de-icing products prior to the heat of the summer, so the de-icing chemicals don’t have time to set on your vinyl deck. You can also use kitty litter for something a bit less…salty. You really never know when spring is going to start – when all that powdery, fluffy snow will turn into a wet mess. If you can make an effort to regularly clear snow off your deck before it become wet and heavy you’ll have an easier time with spring cleaning, prevent water from pooling on your deck, and will be able to enjoy your vinyl deck that much earlier in the year. Winter is also a great time to consider a vinyl deck replacement, if you book with a professional vinyl membrane installer early you’ll be first on the list next year.